A lack of access to education prevents millions of children and young adults from breaking out the cycle of poverty. School fees, uniforms and the need for basic school supplies stand in the way of many children attending school consistently. Africa is home to 43% of the world’s out of school children. Children in Sub-Saharan Africa are less likely to go to or to finish school than our children in the US. Education continues to be one of the least funded sectors in humanitarian appeals. In 2015, humanitarian agencies received only 31% of their education funding needs. When a child is not educated and then not offered opportunity to do something with that knowledge, it becomes difficult, if not impossible, to break the cycle of poverty. As they focus on simply surviving, any future thoughts of more remain an unattainable dream. EMPOWER HOPE seeks to develop excellence in all we do. By providing extensive training for our team, we equip our Ambassadors to perform at the highest level. ~ Biblical Counseling: To develop a biblical worldview and recognize the core truth that guides right thinking and actions. MAKING FACES Educational Programs are all about creating purpose and hope for marginalized children. Through intentional relationship and teaching, we develop self-esteem, life-skills, academic skills and so much more as each child learns that they are truly valuable and have a purpose in this world. Empower Hope's life skills programs teach skills which are necessary to become responsible, caring, and productive citizens and to be the next change-makers. Our after school programs offer personal attention and a safe place to come together to work on homework with a mentor, have a nutritious snack, play games aimed at teaching cooperation and skill building and learn about how special they are to God and others through intentional relationship-building lessons. 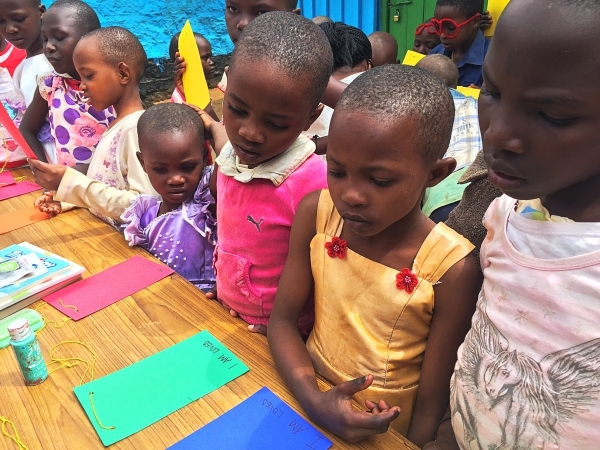 Our HUHO (Hand Up Help Others) program is a fun-filled values based program aimed at instilling value in vulnerable children and to help them discover their uniquely designed gifts and talents that are given to them to serve others. The curriculum is designed around Psalm 139 and parts of the body. There is never a day that goes by during HUHO that the children aren't learning, laughing or wiggling! Click below to learn more and to see HUHO in action. Empower Hope has strategically partnered with Open Schools World Wide (OSWW) to create lasting change in the lives of orphans and vulnerable children in the worst slum conditions. These children have practically no hope of ever attending school or breaking the cycle of poverty. OSWW interventions make it possible for these children to receive an education and to know that there is someone out there who truly cares enough to invest their time into them. Click below to learn more about how OSWW and Empower Hope are bringing hope and purpose to these precious children and their communities.